I first became aware of cinematographer Darren Genet when I encountered his work on All the Boys Love Mandy Lane, a surprisingly lyrical and beautiful horror film that had more in common with the work of Terrence Malick and ’70s-era Peter Bogdanovich than with other teen slasher films. Awestruck by Genet’s visual originality and technical precision, I continued to follow his work as he ventured into television (CSI: Miami) and continued to evolve as a feature cinematographer on films like Jada Pinkett Smith’s criminally underrated directorial debut, The Human Contract. That film exhibits all of Genet’s strengths: a bold and expressive palette, lighting that has an extraordinary tonal range and is simultaneously gorgeous and organic, and elegant compositions and camera movements that serve as well as expand upon the ideas in the script. 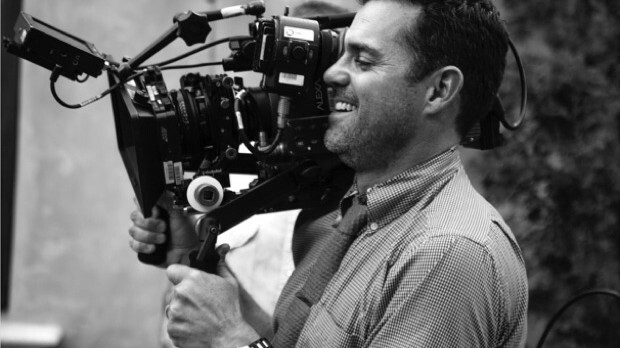 All of these talents have served Genet well in his position as director of photography for The Vampire Diaries, which has developed into one of the best-looking, most cinematic shows on television. Genet has been with the show since season five; as he prepared to begin work on season seven, I spoke with him about his work on it as well as his series of Muse short films, which are currently streaming at muse-film.com and Darren’s website, darrengenet.com. Filmmaker: When you came on board The Vampire Diaries, it had been on for four seasons and already established certain stylistic motifs and devices. What’s it like coming into that environment as a cinematographer? What are the challenges and what are the advantages? Genet: I’ve been in this position before, coming on to a show with an established tone and cinematic language. In each of these situations, the creatives had been feeling a bit stuck visually and looked to me to elevate not only the look of the show, but also to bring a spark of energy to the camera. The challenge is to work within the established language (and crew) to elevate the look and bring your own taste to the party. The advantage of a situation like this is that you are given the freedom and responsibility to bend and stretch the established look to hopefully bring it to someplace new and exciting. Filmmaker: How did you get the job in the first place, and what were your initial conversations like with the producers? Genet: Producers Pascal Verschooris and Chris Grismer had seen my work with Francis Lawrence on Kings for NBC and thought I would be a good fit. After speaking with them briefly on the phone, I watched the previous seasons and came up with my own ideas of what I liked about the show and thought could be improved. We sat down and went through specific images from the show and talked about what worked and what we could do to elevate the look of the show. Showrunner Julie Plec and I then sat down in LA and had a great conversation about our tastes and how to make the show more cinematic. We realized we had a lot in common in terms of visual storytelling. Watching the previous seasons, I liked what Paul Sommers had done with the use of darkness. The show was brave in that sense and I felt this played to my strengths. I have always tried to push the limits of exposure in my work, so I was excited that they were willing to go for it as well. In terms of lighting, I wanted to concentrate on modeling the faces in closeup, while still honoring the contrast and darkness of the environments. Composition was another place where I thought I could put my stamp on the show, striving to create cinematic frames using a wider range of lenses and bringing a more interactive moving camera to the show. Filmmaker: One of the things I’ve admired about your work since I first encountered it in All the Boys Love Mandy Lane is that you create gorgeous images on what are often tight schedules and limited budgets, whether it’s the world of independent film or television. How do you manage to achieve the effects you want when your resources are limited? Genet: I think the most important concept in my work is to keep it simple. My training and taste has always been for single source lighting, using contrast in the lighting to create depth. One light in the right place takes the place of three or four in the wrong place. One of my favorite aspects of this show is the producers’ bravery for expressionistic and daring photography – we are encouraged to push the boundaries and encouraged to try new approaches, as long as we stay within the language of the show. The supernatural nature of this show lends itself to contrast, as the show itself is about the struggle between light and darkness. I think when you have limited resources, you challenge yourself to find a way to tell the story in a new and innovative way. Sure, it’s always nice to have all the toys and time in the world, but the limitations often inspire the creation. Filmmaker: Do you have a kind of lighting, for lack of a better word, philosophy? Are there certain things you try to do on each project, or do you reinvent your approach depending on the demands of each given movie/TV show? Genet: I try not to force my own taste onto a project, but to let the project tell me what it needs and then integrate my own aesthetic. In general, I tend to prefer mixing the softest light possible on faces with lots of contrast in the environment. In my opinion, there should be a true black and a true white in each frame, with all the tones in between. I also enjoy breaking down the cleanliness of the image however possible and am always striving to find new ways to subvert the image, through flares, older lenses, hand crank cameras, shutter effects, and whatever tools I can use to break down the image. The fun is trying to find new ways to make something look either old or damaged. The supernatural tone and horror elements of the show really lend themselves to this kind of approach. Filmmaker: What does prep on a typical episode of The Vampire Diaries consist of? Genet: We don’t get a whole lot of prep on the show, so we have to be very decisive when going through the scripts with the directors and ADs. The first couple of days in prep are the “dream” stage, where anything is possible. As we go through the schedules and budgets, we then enter the “dream crush” stage of the prep, where we realize that we only have limited resources and have to choose our battles wisely. We settle into a good compromise space where we focus our energy on the most challenging and visually important scenes in the episode, Luckily, on this show we have such great writing that the actors carry the most dramatic scenes; we are able to provide the right environment to catch great performances and get out of the way. Filmmaker: How large a part do visual effects play on the show? Genet: There is a lot of VFX work on the show, with all the supernatural characters and scenes. At one point, we had four characters in scenes all played by the same actor! We have a great VFX team on the show and work well together to make sure the practical photography, special effects and visual effects blend together seamlessly. Filmmaker: What are your go-to cameras and lenses on the show? And how do you use filters and diffusion? Genet: We have two ALEXA cameras rolling at all times, using Optimo Zooms and Cooke S4 Primes. We try to stay away from the mid size primes and stay on either the widest or longer lenses. The show has become a longer lens show in the past few seasons, trying to limit depth of field and create a more cinematic look. Personally I like to use grads and polas outside and occasionally inside to control walls and glare. We are fortunate to have such young beautiful faces on the show, so I tend to use soft lighting for them and only use diffusion filters for specific moments, either for glamour or for effects. Filmmaker: What kind of lighting package to you have? Genet: Our lighting package is pretty straightforward. We like to use broad soft light on the show, so we mostly use open face tungsten units through large diffusion frames. Beyond that, we use small LED panels for tight spaces and Dedo lights for accent lighting. We do have and frequently use special purpose lights like Sodium Vapor lamps and Lunestra tubes. Filmmaker: You alternate director of photography duties on the show, shooting every other episode. How much coordination is there between you and the other cinematographer, Mike Karasick? Genet: The collaboration with Mike is great in that he was the gaffer on the show when I first arrived, so we had a lot of time together on set to get to know each other. I also feel that we have very similar sensibilities in terms of lighting and photography, so the work on the show fits together well. Mike and I both try to push the limits of the show and experiment, so I like to think we both inspire each other and keep each other in check. Filmmaker: When you made the transition to directing on a show, you worked directly with Karasick. It seems like a unique situation to me, in that the director has also been a cinematographer on the same show as his director of photography. Genet: The transition to directing on the show felt very natural, and Mike was very helpful with that transition. Since he and I had worked together as DP and gaffer on the show, we already had a shorthand on the set. I am very specific with the camera when I am directing, and working with Mike elevates my own ideas as well as supporting me. It’s a great situation because I know the tone of the show and have relationships with actors, as well as feel the support of the entire crew. Makes quite a difference when everyone wants you to succeed. Filmmaker: How did you make that switch in the first place? Was it something you had been hoping to do all along? Genet: As a DP in the television world, directing seems like a progressive step in the storytelling evolution. We are responsible for so much on the set and have such intimate collaborations with the directors that it feels right to venture into directing. For me it was not only about a new challenge and a way to exercise some new storytelling muscles, but also a way to become a better cinematographer. Directing gives me a lot of insight into shooting and vice versa. I’ll be directing on Vampire Diaries and The Originals next year and am excited to keep challenging myself as we move forward. Filmmaker: You also recently directed and photographed a series of shorts starring Vampire Diaries’ Kat Graham. Tell me a little about the origins of that project, Muse. Genet: Kat and I were talking about the idea of inspiration: where it comes from, how relationships can inspire, and how that affects our work. I instantly connected with the idea of finding inspiration and the more we talked about the project, the more visual it became. Being a longtime fan of Film Noir, French New Wave, and street photographers like Sophie Calle and Saul Leiter, the opportunity to create a series of films with that tone in mind was irresistible. Listening to her music moved me to work with Kat to create a stylized, complicated narrative where passion inspires and consumes our characters. We made these short films and had a debut screening at Cannes earlier this year. Filmmaker: The black and white photography is really exquisite. Talk a little bit about shooting in that format. Genet: Although the final image is black and white, we shot in color and treated it in post. Billy Gabor at Company 3 did a fantastic job of finding the black and white look from the raw ALEXA footage. That said, we shot the films with the intention of finishing in black and white, which informed all the choices in production design, wardrobe, makeup, lighting etc. The challenge is to think in tones instead of color and to make sure that our choices were more about contrast than anything else. My background and passion is in still photography, so I was excited to work with an aesthetic that had such a connection to classic still photography. For photographic and tonal inspiration, we looked at street photographers from mid-Century America like Robert Frank and Bruce Davidson, as well as classic film noir movies like Out of the Past and Night of the Hunter. Filmmaker: How has directing influenced by your work as a cinematographer? Darren Genet: The most important lesson I learned from directing is to sometimes stay out of the way of a good performance in a pivotal dramatic scene. Some scenes are best played in close-ups and the most important role for the DP in that moment is to create an environment on set to allow the actors to get to that great performance, without becoming too technical or specific in regards to lighting and marks, etc. Other times the actors will rely on you completely to provide the foundation for their performance with the camera and the lighting, but sometimes, the best approach is to step back. Jim Hemphill is the writer and director of the award-winning film The Trouble with the Truth, which is currently available on DVD and iTunes.